When selecting a roofing contractor in Lakeland, we know you have a lot of options. Many roofing companies are eager for your business, but it’s important to select a roofing company that keeps your best interests in mind – and this is where Wood’s Roofing can help. Whether you need a small roof repair or a new installation, we promise to treat your home as if it was our own. With more than 30 years’ worth of experience, Wood’s Roofing is the name that you can trust for all your roofing needs. In order to meet your needs and expectations, we train our team to achieve high standards. At Wood’s Roofing, customer satisfaction means listening, planning, preparing and delivering a smooth and pleasant customer experience – every time. We go the extra mile. At Wood’s Roofing, we perform a pre-job walkthrough with our team before work begins to set expectations and achieve customer satisfaction from the outset of the roofing project. We add value and peace of mind with above-standard materials and craftsmanship. We do each job in a timely and consistent fashion, producing excellent results every time. We are fully trained and prepared professionals installing roofs that stand up to Mother Nature. Our staff offers extensive product knowledge and exceptional installation skills. At Wood’s Roofing, we believe that selecting the right roofing contractor is the most important decision involving your project. Your contractor is the only one that can ensure that the roof is installed correctly and will protect your family for years to come. Entrust your next roofing project to the roofer that your Lakeland neighbors trust. Schedule an appointment with Wood’s Roofing by calling us at (863) 513-7775 or by filling out our online form. Roof had suffered hurricane damage. After we removed the solar panels, we reroofed the home in GAF certified materials including Timberline high definition shingles. This lovely home sustained little damage from the hurricane, but the owners opted to go ahead and reroof instead of doing a repair. Good Thinking! They used GAF certified products and Timberline HD shingles. They also chose the Golden pledge GAF Warranty. The proud owner of this home recognized that it was time to do a reroof. He was delighted with the results and as per usual, we only use GAF certified products and Timberline HD shingles. 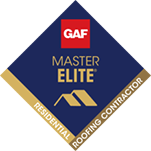 He chose us because we are GAF Master Elite Certified. Why Choose Wood’s Roofing For Your Project?